Delicious Overnight Grains at Starbucks. 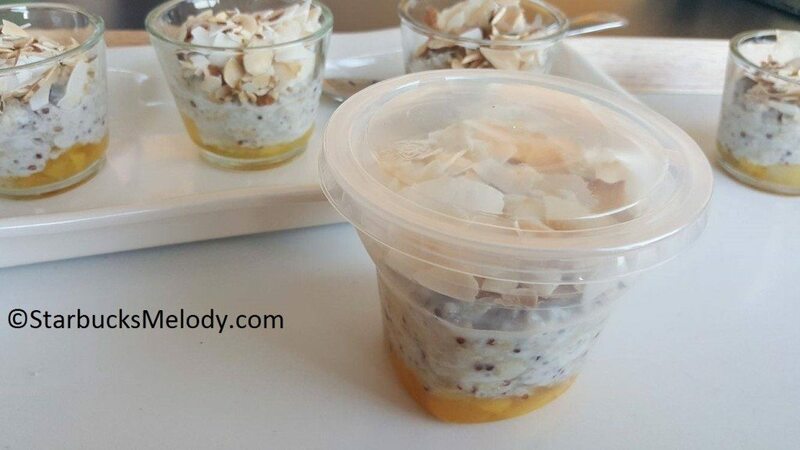 Have you tried making overnight oats at home? Starbucks has a great twist on this, starting today, February 14, 2017. Starbucks Overnight Grains are made from a blend of steel oats with quinoa and chia in coconut milk, tropical compote, and topped with toasted shaved coconut and sliced almond topping. The tropical compote has sliced mango, very lightly sweetened with a passion fruit juice. The overnight grains have 6 grams of protein and they are also vegan. I would definitely eat these any time of the day. The Overnight Grains come in a plastic container, in the cold case section of the store. The picture above shows the packaging, although missing its label with nutrition information and ingredients. These are totally delicious and very healthy too. 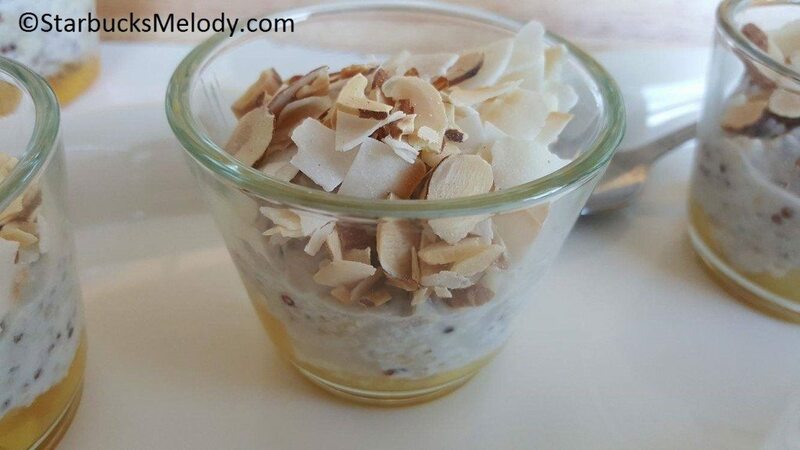 It’s a little sweet from the fruit compote, has some crunch from the almonds, and great flavor with the added coconut shavings. I really, really liked this. Here is the bad news: This is a test item only. You’ll find Starbucks Overnight Grains in New York metro area stores. I wish I could get this in Seattle! Fresh baked pastries at Starbucks: Yum. CUP Fund: Partners, you can round up to donate. Noooooooo… I was so excited to read your article about Starbucks introducing Overnight Grains until I got to the last paragraph! I hope this is a successful test and is quickly rolled out across the US. Or at least make Chicago the second test market! It sounds yummy. I’m in New York often for work – looking forward to trying this! Mmmmmmm… These sound so good. You totally had me at toasted coconut. Finally tried this today – so delicious!!!! They’re now available in Seattle! Just had it last week and it was delicious! I had one in Bellevue Washington today… It’s amazing. I am not a vegan, I eat all foods. I highly recommend this! It was available for like a month in my area and then disappeared. North Jersey….was it discontinued? Help!